Inventory We are a resale marketplace, not a box office or venue. Ticket prices may exceed face value. This site is not owned by Matthew Knight Arena . The Matthew Knight Arena opened in 2011 as home to the University of Oregon Duck men's and women's basketball teams. 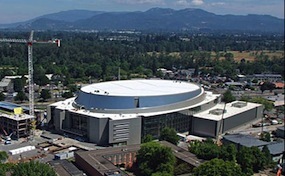 The arena was named after Nike founder Phil Knight's son Matthew who died in a scuba diving accident at the age of 34. Local concern for the arena was justified at the time of construction. The income for the facility was grossly overestimated and there was only limited street parking. Recent updates include additional parking, better waste management, and public transportation access to the venue. The Matthew Knight Arena box office is located at 1776 East 13th Street on the University of Oregon campus in Eugene, Oregon. The venue has a seating capacity of over 12,000 and was built for a staggering $227 million. The Matthew Knight Arena also will host concerts such as Florida Georgia Line. MatthewKnight.ArenaEugene.com is not currently affiliated with any official box office, website, or primary supplier. We operate exclusively in the secondary ticket market allowing our customers to order tickets to events across the country. Prices on our sites may be below or above face value and will change with demand. To order tickets for all Matthew Knight Arena Eugene events please contact one of our operators by phone or follow the procedure online through the checkout.